Home - E. Anthony, Inc.
E. Anthony, Inc. was founded in 1982 by Edward A. Gierczyk, with the express purpose to create a construction company that provides excellence in service and quality with personal attention for its clientele. Since that time, our design/build company has established a successful track record in construction for a variety of commercial, industrial, and municipal facilities within several locales. Our company provides a construction team that maintains a strong work ethic. We maintain a personal dedication to our clients as well as an interest in each local community we build in to ensure a successful project. Headquartered in Tinley Park, IL, (EAI) has evolved into a full-service construction services company that is able to provide seamless support that includes land acquisition, architectural and engineering services, and general construction services that can be tailored to any combination needed to fulfill the clients specific requirements. Our commitment is to provide our clients with the best value for their immediate investment and create opportunity for the future. We take great pride in our growing list of repeat customers that provide us with additional opportunity and continued relationships into the future. EAI recently completed the world’s first 36,000-square foot Nissan NREDI 2.0 prototype facility for Zeigler in Lindenhurst, as well as the first and largest Nissan 2.0 facility conversion for Berman Nissan in Chicago. 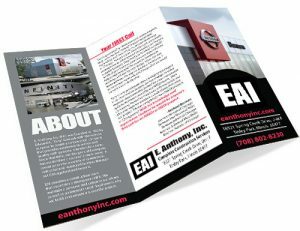 At E. Anthony, Inc. we take pride in knowing our finished product is 100% of what the customer expected. Walkthroughs of the project, with the client, are done routinely to ensure the best end result for our customers. Click here to visit our online project galleries section. Copyright Affordable Web Design, Web Hosting and Maintenance provided by Alkon Consulting.